Pink, blue, white, mauve? What can you expect? Hydrangeas have a reputation for being chameleons, but not all hydrangeas change color. Although many hydrangea flowers age to a mauve color, if you have beautiful white pom poms, you’re not going to change them to pink or blue. 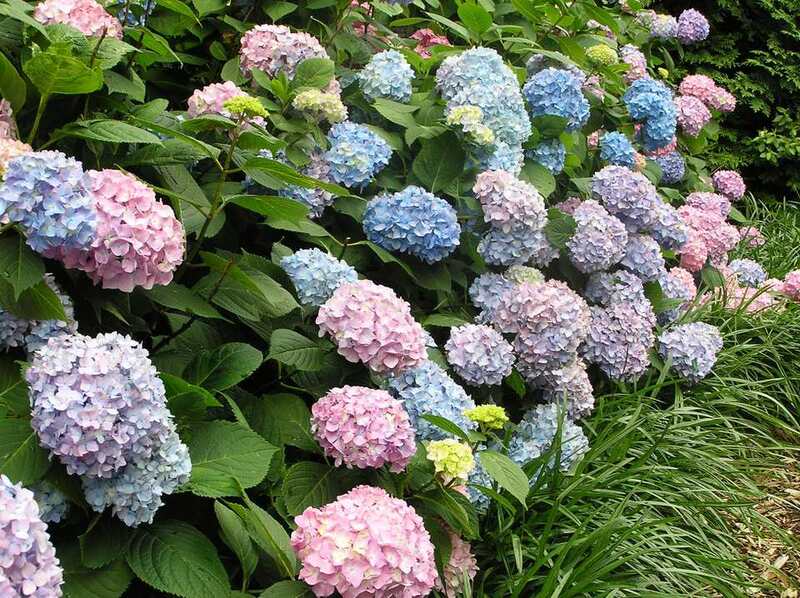 Generally, you will need to grow Big Leaf Hydrangeas, Hydrangea macrophylla, to get the pink or blue color you are seeking. There are also blue hydrangeas sold by florists, especially around Easter. These hydrangeas are not particularly hardy and, having been forced to bloom early, may not adapt to being planted outdoors. But it is possible to exert some control over your bigleaf hydrangeas. You needn’t become a chemist, but you will need to understand why your hydrangeas change color. The soil pH should be slightly acidic (5.2 - 5.5).Do a soil test first, to determine your starting pH. Adding aluminum sulfate to the soil will help lower its pH, if necessary. A word of caution: not all plants can tolerate acidic soil and neighboring plants may be adversely affected. Always follow label recommendations when adding amendments to your soil. There must be aluminum present in the soil. If aluminum is naturally in your soil and the pH is low, your hydrangeas are probably already blue. But even if you have naturally acidic soil, you may need to add some aluminum sulfate. Fertilizer - A high potassium, low phosphorus fertilizer helps maintain your blue color. Avoid superphosphates and bone, which are sometimes used to encourage bloom. Add dolomitic lime, to raise the soil pH to about 6.0 to 6.5. This is a good range where hydrangeas can’t access the aluminum in the soil, but don’t suffer other nutrient deficiencies and chlorosis. Contrary to common belief, you don’t want to make the soil truly alkaline. Grow your hydrangeas in pots. Seriously, soil-less potting mixes don’t usually contain aluminum, so there’s no chance of your hydrangea reverting to blue. Even if you have hydrangeas that turn pink or blue, adding more amendment to the soil will not intensify the depth of color. Color may vary from season to season due to weather, plant stress and changes in the environment. Plants near a concrete foundation or walkway may never turn blue because of the lime that leaches out of the concrete. Altering your soil to change your hydrangea’s color is not a one-time thing. You will have to maintain the altered soil conditions.